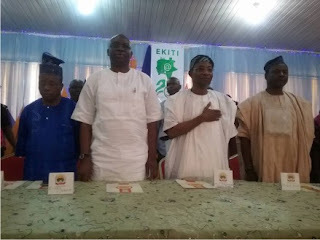 Governor Ayodele Fayose of Ekiti State has stated that even if the Peoples Democratic Party(PDP) picks his son as national chairman, he will still run for presidency in 2019 election. The Governor said that Nothing can stop him from contesting the 2019 election. He said: “It is the Presidency that orders things. “When I become President in 2019, I will reorder those things. Nothing can stop me from contesting,” he told Vanguard.